Pagezii creates weekly social reports for your Twitter account. It summarizes your Twitter metrics including your engagement and interactions. It also generates comparison graphs against competitors. These competitors are easily editable in your report configuration screen. The report is emailed to you every week. Pagezii uses a Twitter Score to signify the social strength and influence of a Twitter account. The score ranges between 1 and 10. 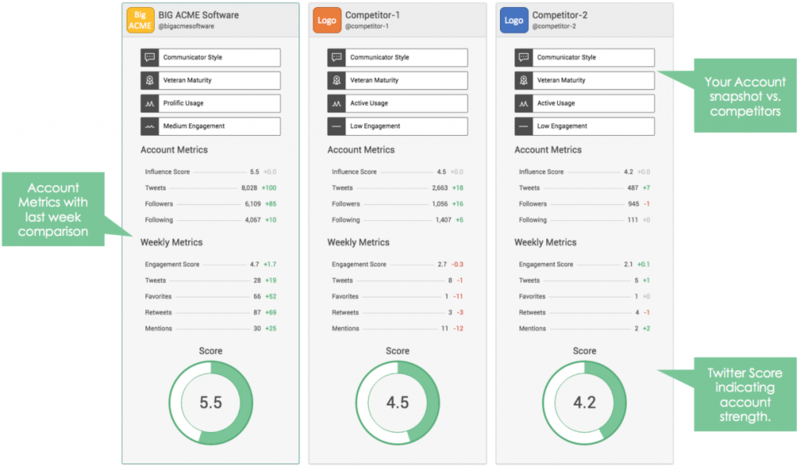 Typically, Fresh accounts have a score lower than 3. Established accounts have a score between 3 and 6. And influencing accounts have a score of 6 or higher. Pagezii also analyzes Twitter Hashtags and trending words from your account and compares their performance against your competitors. Based on these analysis it creates a Trend Focus ratio. The higher the ratio, the more aligned your Tweets are with the industry. A well aligned account typically has a score of 80% or higher. The Twitter weekly report helps your marketing department understand their twitter footprint better. It also provides weekly analytics to gauge the success of your social media campaigns.